Today I’m reviewing one of my recent investments. 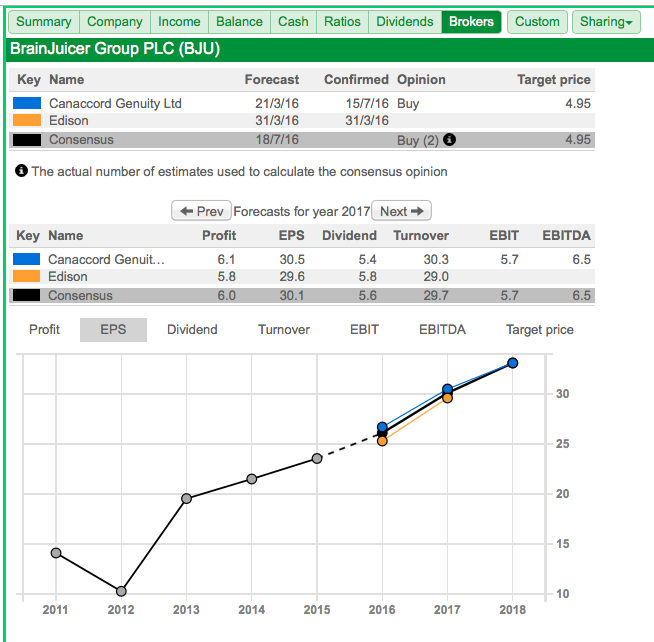 The company in question is BrainJuicer (BJU), which you may recall I revealed as a fresh holding within this second-quarter portfolio update. I purchased my BJU shares at an average price of 325p (including all costs) during March and April 2016. The bid price is now 425p and the position currently represents about 2% of my portfolio. I have to admit, BJU is somewhat quirky in comparison to many of my existing holdings. The group is a market-research agency and has pioneered techniques to judge the potential success of adverts using ‘behavioural science’. If you’re wondering what on earth behavioural science is, don’t worry. For years BJU’s business never made much sense to me — until I read this year’s annual report, watched a beer advert… and finally got to grips what this £58m small-cap actually does. Anyway, supporting the notion that BJU had above-average investment potential was a respectable record of progress, decent financials, an executive team led by the firm’s founder/major shareholder… as well as the opportunity to further ‘disrupt’ the wider market-research industry. BrainJuicer (BJU) was established during 1999 by John Kearon, who had spent the previous 15 years in various marketing roles. During that time he concluded traditional market research was “slow, expensive and either lacking in depth… or lacking in accuracy”. Mr Kearon’s experience prompted him to devise, trademark and patent an online system for collecting responses from consumer panels. A notable innovation within Mr Kearon’s service — dubbed ‘Mindreader’ — was that panel members could submit open-ended answers and the software would then evaluate the results based on the most prevalent themes. The service soon built up a blue-chip customer base, with the likes of Unilever and Heineken becoming early clients of the system’s analysis. Mr Kearon then went a step further in 2005, when BJU became the first research agency to use the ‘wisdom of crowds’ to try and identify winning product ideas. According to BJU, “it turns out, we’re better at predicting what other people will do than we are at predicting our own behaviour”. For this type of ‘crowd’ analysis, the online panel is asked to anticipate what other people will answer in the survey. The system in question, ‘Predictive Markets’, is now the company’s best-selling service. One of BJU’s latest developments is ‘ComMotion’, which uses human emotions as a guide to forecasting successful advertising campaigns. This approach involves panel members clicking on different faces to represent their feelings as they watch the client’s advert, with the theory being that consumers are far more likely to act upon marketing that makes them happy. Still in charge of BJU today, Mr Kearon has become a strong advocate of using behavioural science to assess whether marketing campaigns will be successful or not. “Behavioural Science is showing us how people really make decisions and it’s more emotional and irrational than classic marketing theory. Instead of a left-brain, right-brain model that assumes great marketing is equal parts emotional and rational, we now know our million year old System1, emotional, intuitive brain holds sway over our 100,000 year old System2, rational, analytical brain. Apparently, we all might like to believe we’re logical, analytical and deliberate people (System2), but in reality our decisions are mostly made subconsciously, instinctively and emotionally (System1). An example of System1 and System2 thinking comes from the following simple test. 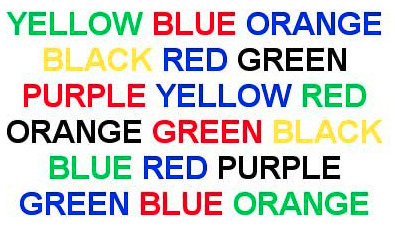 Your System1 brain just wants to read out each word, while your System2 brain tries valiantly to override it by stopping and thinking about the colour. …can become so successful (BJU predicted the advert would be a winner for its client, 3 Mobile). Other adverts that BJU has rated as 5-star ‘emotional System1’ winners can be found at www.feelmore50.com. Everyone ends up happy and high-fiving, and when you’re next buying (Canadian) beer, you might just choose that brand because you remember the positive feelings you experienced when watching the ad. Anyway, it was when I watched these feelmore50 videos for the first time that I started to appreciate what BJU was trying to achieve with its ’emotional marketing’ analysis. Whether those videos — and my attempt to explain behavioural science — has helped you understand what BJU is trying to achieve, I don’t know. 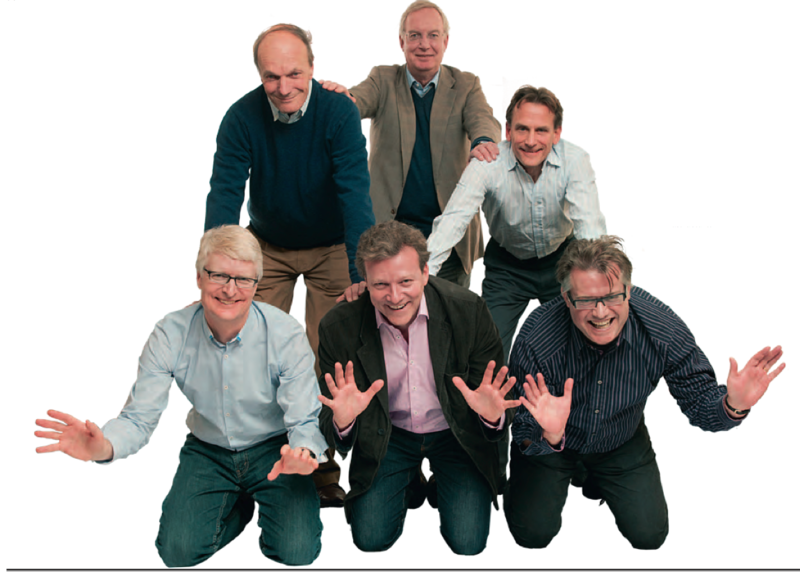 If you are still at a loss, ace investment writer Richard Beddard has done a great job describing what the business does through his AGM write-up. The group’s offbeat website also offers details of the services provided. I must confess that BJU does not have the most extensive of financial track records. Skim through the archives at Companies House and you’ll discover revenues were first recorded in 2002 (£237k) and an operating profit was first struck in 2004 (£187k). Yet BJU’s subsequent growth has been impressive. At the time of flotation in 2006, revenue was £4.6m and operating profit was £477k. By 2015 and with new offices having opened in the States, Europe and Asia, revenue had topped £25m while operating profit had reached £4.5m. Other highlights from BJU’s financial history include three special dividends (2008, 2013 and 2014), very little in the way of exceptional items, plus a lack of acquisitions. BJU’s generally positive progress has ensured the share price has made good headway over time. Floated at 108p almost ten years ago, the shares hit a 540p high during 2014 although earlier this year they had slipped to as low as 280p. Annual figures published during March showed revenue up 2%, gross profit up 4% and operating profit up 8%. BJU claims gross profit is the “best indicator of… top-line performance” because it excludes various project expenses that are passed on to the client at cost. Still, a 4% gross profit improvement is nothing special — a performance BJU explained was due to re-jigging its business towards the products that provide greater ongoing income. An update during July subsequently revealed first-half trading had been “generally encouraging”. BJU stated its half-year revenue and gross profit had increased by 13% and 15% respectively, although both advances were aided slightly by favourable currency movements. Underlying first-half operating profit was said to be “similar” to the £1.7m reported last year, although costs this year included an extra £0.3m spent launching a new creative division. BJU added that it ought to meet market expectations for the full year and claimed it was “too early to say” what impact Brexit could have on client budgets. I must admit that I have previously had my doubts about the aforementioned Mr Kearon and his fellow BJU directors. That was in 2011, and was included in what was a terribly designed annual report. Just open this PDF and have a look for yourself. You’ll find PR articles taking precedence over the chairman’s statement, the financials published in the smallest font available, and the pages adorned with garish and unnecessary pictures. Looking back, BJU’s 2011 report marked a hubristic high point — a profit warning in 2012 then prompted the company’s reports to suddenly shift to black and white and dispense with the pictures. I have to say, such statements can now pardon the executives for their earlier annual-report misdemeanour. Mr Kearon is accompanied by a finance director (appointed 2003), an operations director (appointed 2010) and three non-execs. I note one of the non-execs was group sales and marketing director at Imperial Brands, so ought to be able to provide a reasonable client perspective. I don’t have too many gripes about board pay. Mr Kearon is on a near £200k basic salary, which does not strike me as outrageous when the business produced a £4.5m operating profit during 2015. I note Mr Kearon’s pay has advanced by just 21% during the last five years while the group’s operating profit has doubled. I am pleased the board has foregone annual bonuses to instead partake in a clear-cut option plan. The board’s 2014-2016 option scheme requires earnings to compound at a hefty 15% a year and — importantly — the share price also has to reach 505p before the plan pays out. The downside to BJU’s options is dilution — the 2014-2016 executive scheme could see the share count expand by almost 5%, and with other options granted could result in total dilution of 10% (based on the year-end 2015 figures). Still, Mr Kearon’s 27%/£14m ordinary shareholding — and his decision to pay chunky 12p per share special dividends during 2013 and 2014 — suggest to me he is running BJU with the owner’s eye. (A transaction announced in March raised a few eyebrows, with Mr Kearon selling 500,000 of his shares — most of which were bought by the company. BJU’s accounts are quite straightforward. For a start, the balance sheet carries no debt and no pension obligations, while the July update said cash was a healthy £5.2m (42p per share). BJU’s bank balance all looks surplus to requirements to me. I guess BJU’s margins are helped by its online surveys being much cheaper to run than traditional telephone/face-to-face interviews that require lots of staff. Whether those margins can be sustained is hard to say. It is not out of the question that rival research agencies could adopt similar online techniques and offer better terms to steal BJU’s clients. Typically very little is spent on tangible and intangible assets (software), and what is spent is covered by the associated deprecation and amortisation entries that are charged against earnings. In addition, the aggregate £1m or so diverted into debtors and creditors during the last five years looks quite fair when you consider operating profit has doubled to £4.5m since 2010. The decent margins and asset-light nature of the business translate into some wonderful return on average equity (ROAE) calculations. Strip out the group’s cash from the denominator and I make the 2015 ROAE result to be £3.0m/£2.6m or 116%. The average from the last ten years is about 68% (adjusted for the cash position). Here’s how I decided it was worth investing at 325p following the publication of the 2015 results. I took the 2015 operating profit of £4.5m and added back one-off costs of £320k that related to an office move and an aborted acquisition. I then applied tax at 33% (close to 40% of group profit suffers high US taxes), which gave me earnings of £3.3m or 24.7p per share. After that I subtracted the 2015 year-end net cash position of £6.4m, or 48p per share, from the then £42.3m market cap to arrive at an enterprise value (EV) of roughly £36m or 277p per share. The potential P/E on my EV and EPS estimates was therefore 277p/24.7p = 11. That multiple looked quite modest to me given the group’s growth record and its appealing financials. A perennial risk that BJU freely acknowledges is the “limited visibility” of its revenue. The threat became real during 2012, when clients suddenly stopped spending during November and December — normally the firm’s busiest time of the year. Apparently clients like to use up marketing budgets towards the end of the calendar year — but “difficult economic conditions” during 2012 were said to have contributed to sudden cutbacks. It meant profit that year plunged 45%. At least BJU is not dependent on just a handful of clients. The business served 243 customers during 2015, with the largest representing 7% of revenue. The average revenue per project was about £25k. I guess the main long-term danger with this investment is the dynamic nature of the market-research industry. But there is the chance that a “major system change” will not enhance BJU’s prospects. Indeed, new services that aim to benefit from the anticipated industry change may never take off. For example, I note BJU trumpeted products called ‘Digividuals’ and ‘Satistraction’ within its 2011 annual report — and yet these names now draw a blank from the group’s website search function. There was also a plan to win client ‘mandates’ (where a client uses a particular research service throughout the whole of the organisation). BJU had said winning mandates was “key to propelling our growth” during 2012. All told, it’s hard to say whether BJU’s System1-based testing services will remain relevant during the years ahead — especially when you realise the business only started mentioning ‘System1’ about five years ago. 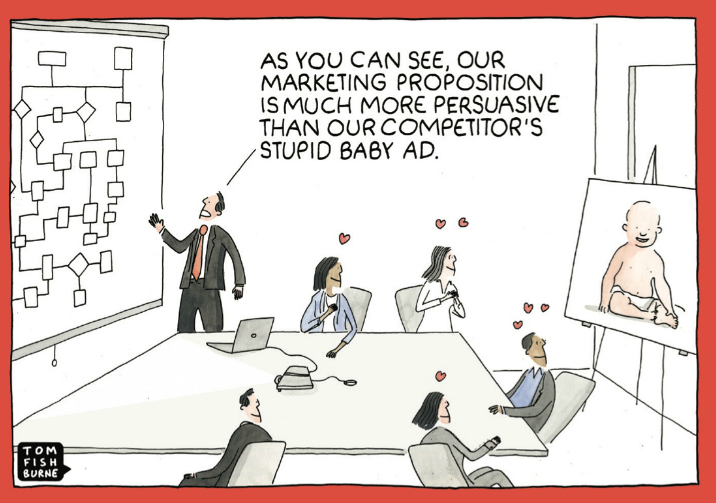 I suppose this behavioural-science concept could all prove to be a marketing fad or complete psycho-babble, and we one day discover the group’s promising financial results to date were in fact all built entirely upon gullible clients, faulty analysis and/or pure luck. Finally, let’s not forget that 21% of gross profit last year was produced by old services that face greater competition and appear to be in decline. Have I been watching too many beer ads? I recognise I have to be careful with marketing-related companies. I mean, the executives often possess vast sales experience and can be very convincing with layman shareholders. I just hope I’ve not been sweet-talked into buying these shares after reading all of Mr Kearon’s persuasive annual statements! Instead, I’d like to think I’ve been quite ‘System2’ about this investment. My (hopefully) rational analysis suggests BJU is a very respectable business with appealing financials and an owner-friendly boss…and which may offer worthwhile growth prospects if indeed the market-research industry does change over time. And when I bought at 325p earlier this year, I thought those growth prospects were not reflected by a very ordinary valuation. Of course, only time will tell whether those prospects will actually come to fruition… or whether I have been seduced by watching too many beer ads! This entry was posted in My Shares, System1 and tagged SYS1, System1 on September 7, 2016 by Maynard Paton.